Now that we have Evie, I want to have some new traditions for her to look forward to at Christmas time. One of the things I want to start is to give Evie an ornament each year. This ornament would have some meaning for her. I got this idea from our friend Momo's mommy--she took all of her ornaments from childhood that she received and started her own tree when she had her own family. And now Momo gets his own ornaments each year! 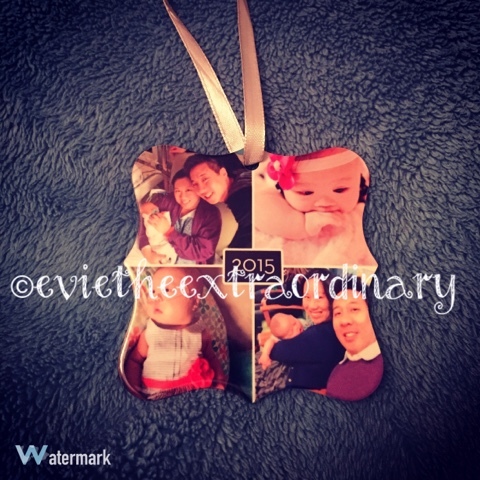 This year, I made a Shutterfly ornament to start us off. It has some of my favorite pictures on each side. Another tradition I want to start is a yearly digital photo album. My dad has painstakingly kept a photo album of our family starting from when he and my mom were married. That is too hard for me to keep up with, but I think I can do a digital photo album each year. I want Evie to be able to look back and see the pictures of when she was little. A favorite tradition that Erick and I already started was that every year we help out at our church's Christmas Choir concert. We are biased, but we think it's the best concert ever. Last year, Evie sat in Mommy's tummy and enjoyed the music. This year, Evie stood at the back with us and bopped around to the music with us. It was so much fun! Like for Halloween, Evie has 3 Christmas outfits. Here is one of them! Wishing everyone a wonderful Advent season!